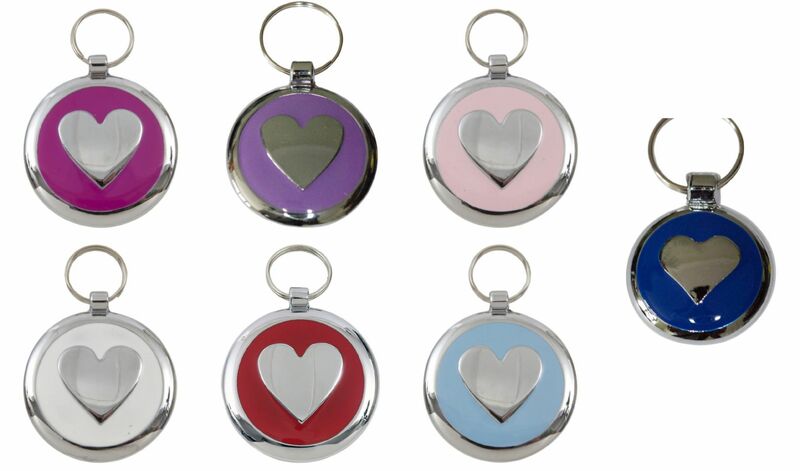 Introducing the breath-taking Tagiffany Smartie Heart collection Pet ID Tag. This adorable identification tag is a must have accessory for any owner looking for something modish yet dashing. The Tagiffany Smartie Heart available in multiple colours Pet ID Tag is manufactured using premium grade alloy merged with a vibrant enamel. These practical, yet vibrant tags offer a unique feature, the placement of the split ring means the tag is positioned flat against your pet’s neck, providing comfort at all times. Not only this, but the tag continually remains a beautiful accessory to be seen by all. The Tagiffany Smartie dog and cat ID tags are manufactured using the finest quality materials available to the market, meaning they will withstand the test of time. With a totally new process of engraving through laser, Tagiffany are able to achieve a fantastic and impressive result, producing crystal clear text. You will have never seen an identification tag so different and outstanding as this design. In the UK, the Control of Dogs Order 1992 states that any dog in a public place must wear a collar with the name and full address of the owner engraved or written on it, or engraved on a tag. Your telephone number is optional, but we highly recommend this. You can be fined up to £5,000 if your dog does not wear an identification tag. The Tagiffany Smartie Heart White Pet ID Tag is available in four sizes: 20m, 25m, 30m, and 38m. Ensuring pet owners are able to purchase the most suitable size for their pets.